One common misconception about bolts is that a higher rated bolt is stronger, yet more brittle, and therefore lower grades should be used in places like in suspension systems so they can deform rather then break. This is wrong! There are two types of forces a bolt experiences, tension and shear. One goes up and down while the other goes side to side. Its often in the shear aspect that people assume lower grade bolts are better in places like suspension systems. 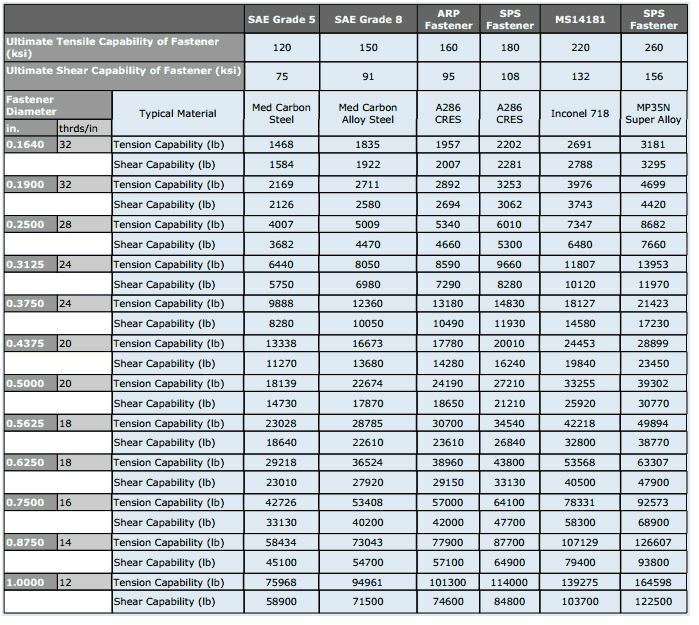 However, as you can see in the following table, both tension and shear are higher in Grade 8 bolts over Grade 5 bolts; in fact over 21% higher in shear and 25% in tension. The same is true in metric when comparing 8.8 vs 10.9. To be fair, the higher the grade of bolt, the harder it becomes as rated by the rockwell scale. Therefore, technically a Grade 5 bolt is softer, and therefore spends more time deforming before failure. This time and area of deformation is called the plastic range. However, as you can see by this graph, even though the Grade 8 bolt spends much less time in its plastic range, it doesn’t even get into the plastic range until it experiences over 21% more force. This same 21% of force, would have elongated and sheared the Grade 5 bolt. So to use a lower grade bolt for the the purposes of it bending versus breaking, unfortunately that is incorrect. The lower grade bolt will reach its maximum elongation and reach its fracture point well before the higher grade even begins deforming. Donnie jackson on JIS vs Phillips screwdrivers and Where to buy a JIS screwdriver. Spike Hodge on JIS vs Phillips screwdrivers and Where to buy a JIS screwdriver.